My greatest challenge as a home cook and blogger is time. As you may know, I have a day job. And with the kind of work we professionals all have on our plates, who has the time to cook? Don’t you just wish you could retire from your day job– and just cook, eat, and write? Dream on, Ralph Guzman. Dream on. If there’s one thing I realized lately, one must make time for his or her passions. Cooking is my passion. And so, I declare now: I will make time for cooking! No more excuses. I have to cook. I live to cook. I will cook! So what does one cook after a short hibernation? My first love and favorite comfort food: pasta. It somehow looks like an ice tray but it’s not. It’s a ravioliera — a ravioli tray. It allows you to make ravioli more easily, as it helps you shape and fill your homemade ravioli fast and in standard size too. So yes, it makes you look like a real pro in the kitchen without making your ravioli look like the frozen, mass produced variant. 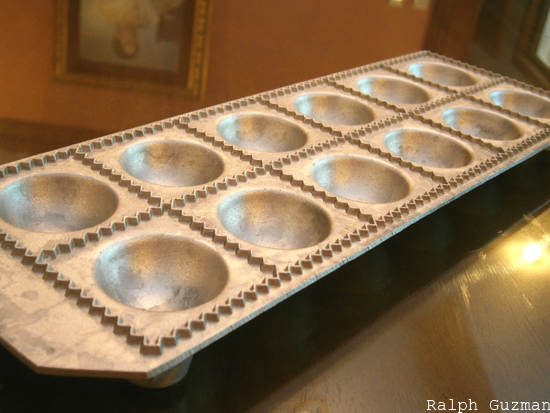 I recommend this tray to anyone who wants to make ravioli on a regular basis. 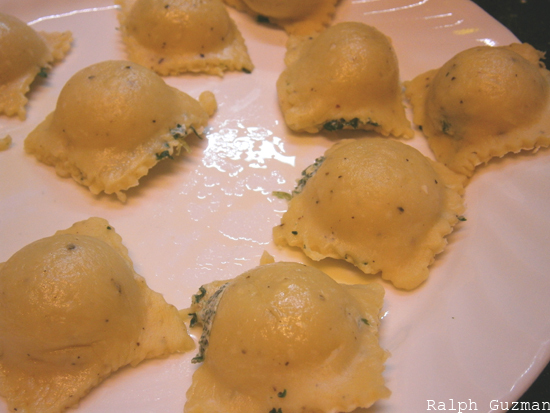 I love ravioli (Did you know that it’s “raviolo” in the singular form?). Raviolo are a traditional Italian pasta which uses two thin sheets of flat egg pasta, with a filling in between the two sheets. I will let the pictures speak for themselves, as you will see in a jiffy. What I love about homemade ravioli is how you can very much put your own filling and surprise your guests and loved ones with it. Using the gift, I decided to make Creamy Spinach and Chorizo Ravioli. It’s a little similar to the Creamy Spinach Spaghettini recipe I did on Comfort Zone’s Episode 2, which I have missed cooking. I started by creating the ravioli. The pasta has two parts. First would be the filling. Second would be the pasta itself. 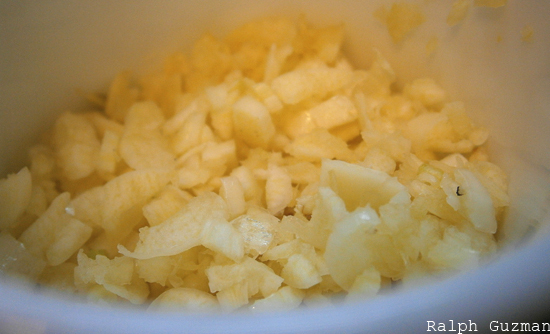 Garlic, 1/4 cup: I use an obscene amount of garlic for flavor. You can lessen this if you want. But I tell you, you’ll miss a lot of you lessen it. Hahaha. Completing the filling: It’s fairly easy. Just dump all the ingredients into the food processor. 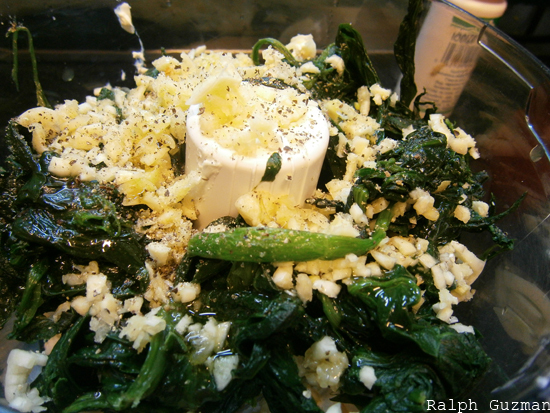 Add salt and pepper plus a tablespoon of extra virgin olive oil for extra flavor. Here’s how it looks after you pulse it. The goal is to go for smooth consistency of the filling. After all, this is a creamy spinach filling 🙂 Set the filling aside so that you can make the pasta itself. I didn’t want a messy counter and I don’t want it ever in the future. So instead of placing the flour and eggs on the counter, I placed them in a bowl. 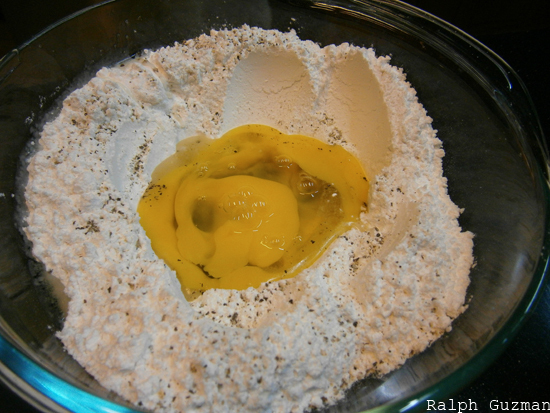 Create a well with the eggs in the middle and the flour surrounding it. 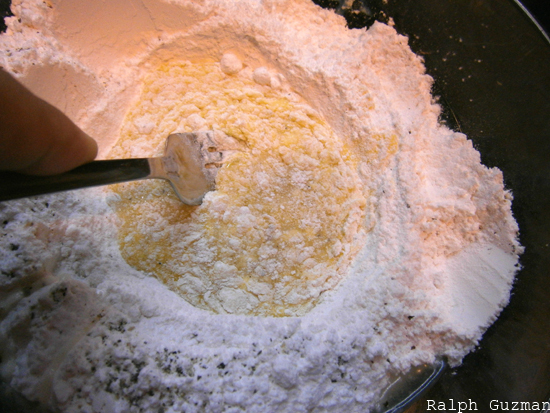 Using a fork, gradually add flour to the eggs until everything has gotten fully combined. 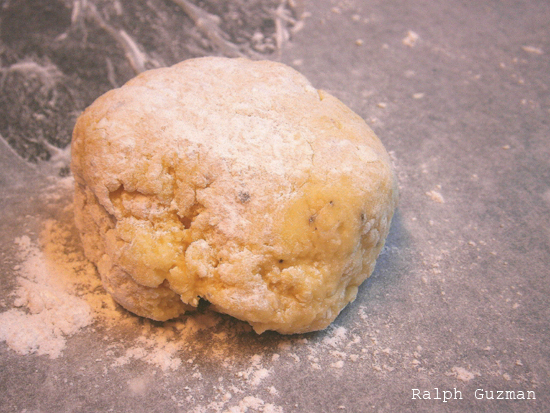 Roll into a ball and divide into 2 smaller balls of equal sizes– for the two layers of ravioli. You will need to lightly dust the balls with flour to prevent them from sticking to your counter or tray when you use your rolling pin. As I didn’t want a dirty counter, I put a long sheet of baking paper on the counter and did all my rolling and kneading there. You can also use a big cookie tray or a large silpat. Once you have the balls, get one ball and turn it into a thin, flat sheet. The flat sheet has to exceed the size of your ravioliera. By the way, you can use your pasta maker to make thin pasta. I did it manually to save up on clean up afterwards. Cleaning the pasta maker machine can be quite tedious. Lay down the dough onto the ravioliera. 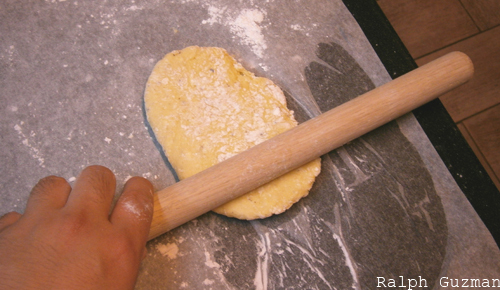 Gently use your fingers to push down the dough and to ensure that the dough follows the shape and contours of the tray. Once this is done, put in the filling. I put 1/2 tsp of filling. You should be able to make 12-15 pieces of ravioli, by the way. If you’re not able to cover the whole ravioliera with dough, that’s ok. You’ll have excess dough later and use it to make more ravioli. 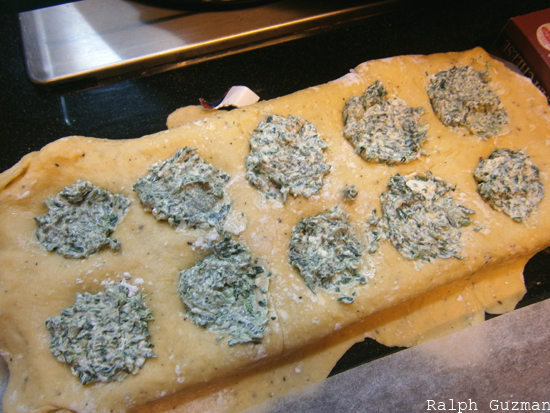 Roll the other ball of pasta dough and place it on top of the ravioliera, covering the topping completely. 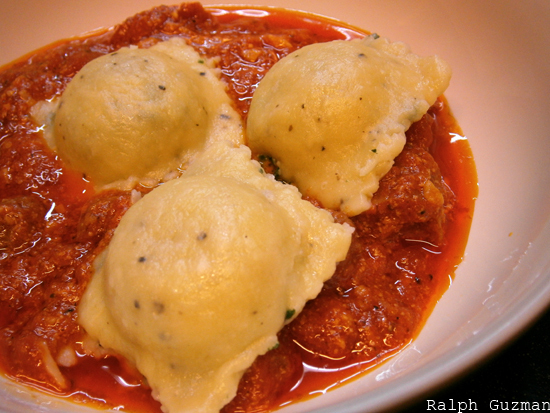 Notice that the ravioliera has a jagged border– a border for each raviolo? They allow you to cut the assembled dough into separate pieces. 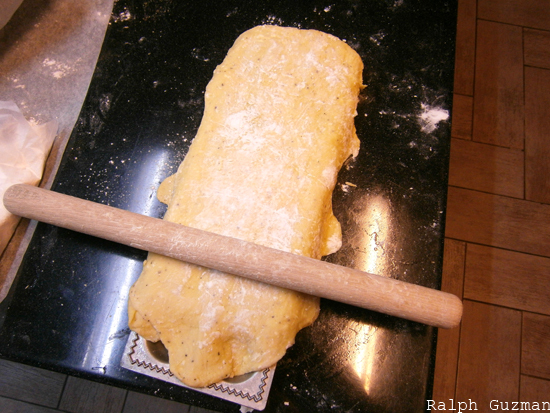 And you can cut the ravioli into separate pieces by using the rolling pin on the dough, pressing the dough hard on the border to each raviolo from the other. 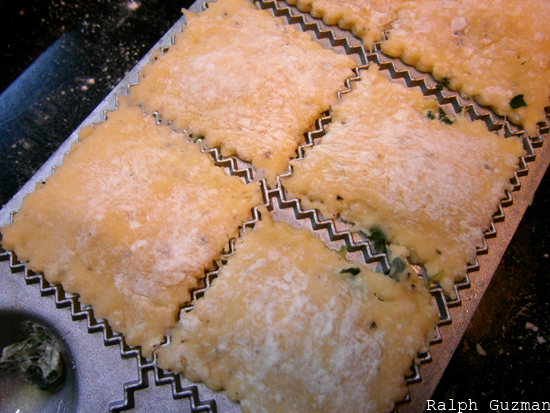 Take out the ravioli from each slot. Then set them aside as you make the sauce. You can also store them in the freezer if you want to cook them on another day. I recommend preparing this ahead if you are making the dish for many guests. I would limit “many” to four or five, if you ask me. You might drive yourself nuts if you make this for 20 people– unless there is someone helping you. And that person may need a ravioliera too. 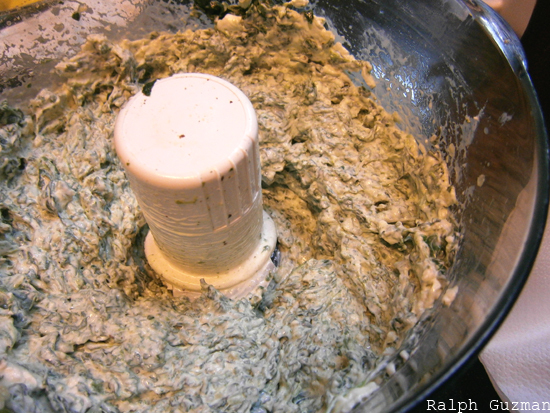 Should you have leftovers of the creamy spinach filling , it would be a good pasta sauce on its own. Chorizo, 1 can: I use instant, canned chorizo. They’re cheaper and more importantly, they taste good. Making the sauce is fairly simple. 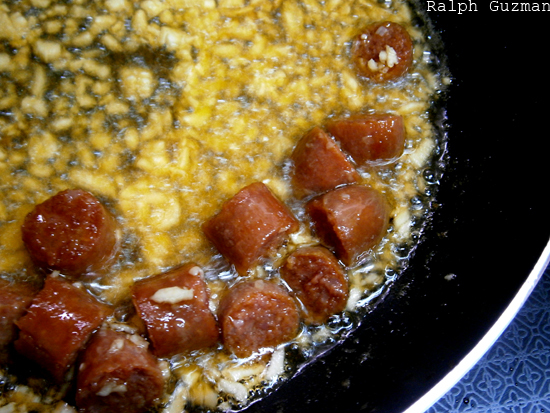 Sauté the garlic and chorizo on a pan that is brushed with olive oil. Make sure to also add the lard from the chorizo. The lard adds a lot of extra flavor! Never mind if they are not exactly the healthiest thing on the planet! 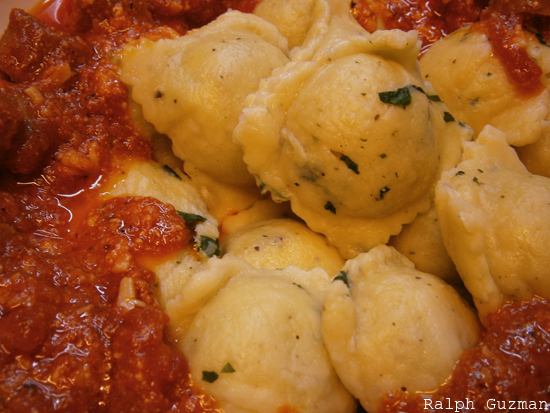 Set aside the sauce so that you can cook the ravioli and assemble everything together. 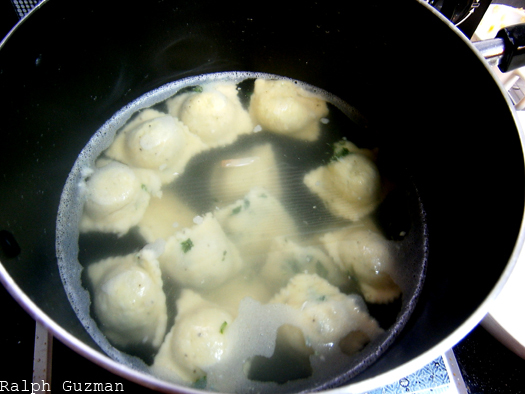 And so, once you have boiling water, put the ravioli in. Take them out immediately after cooking for 1 1/2 minutes. You don’t want to overcook the noodles. Overcooking makes the noodles harder after they’re cooked, while the filling loses its flavor in the boiling water. Now, assemble the ravioli using your favorite bowl! The serving above is good for a group of 3-4 people. The picture below shows a plate for 1 person. Ravioli are filling, so each person or guest can have 3 or4 ravioli per bowl/serving. I don’t put additional cheese on top so that the taster’s attention goes to the delicious filling. Nor did I put basil as a garnish and additional topping to avoid stealing attention from the spinach. By the way, if you don’t have a ravioliera, you can make ravioli from scratch. You’ll just need the same ingredients and tools like the rolling pin– plus a pizza cutter to help with the cutting of squares. The finished product: The noodles came out soft but al dente, while the filling was very creamy. Meanwhile, the homemade tomato sauce with chorizo provide a wonderful contrast to the ravioli. 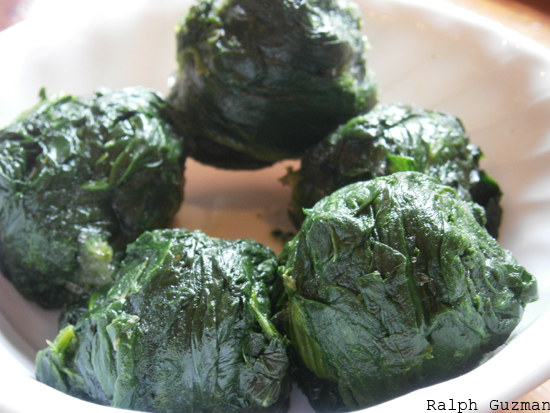 Spinach + tomato sauce = pure yum. One great comfort dish for everyone in the family! Hope you can try cook this one very soon and enjoy making it just as I did. 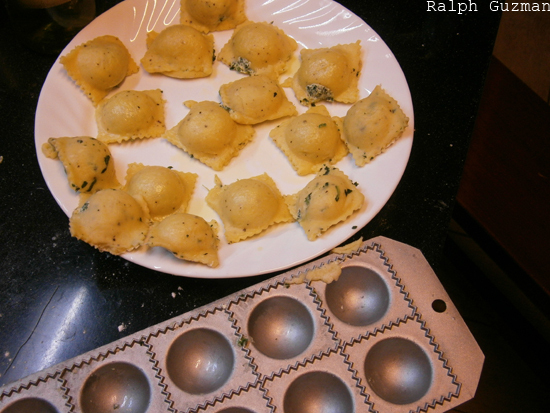 This entry was posted in Food + Recipes, Pasta + Noodles and tagged creamy spinach and chorizo, creamy spinach and chorizo raviioli, creamy spinach ravioli, ravioli, ravioli recipes, ravioli seminar, raviolo by Ralph. Bookmark the permalink.